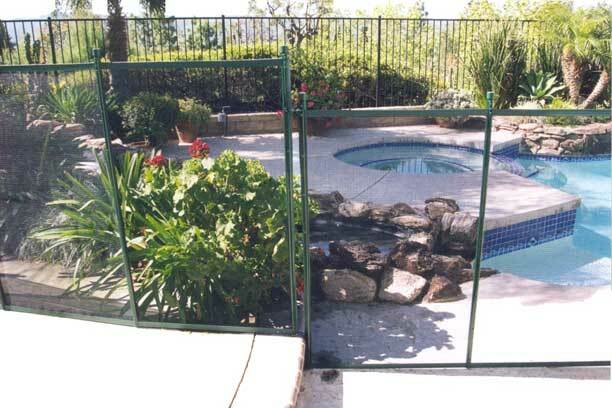 Fence Around The Pool in L.A.
Safety should always be a top priority when choosing any pool fence. Los Angeles is leading in accidental drowning accidents national wide. Your children's safety goes beyond all other aspects that should be considered for a pool, though this does not in any way mean that you will be paying too heavily. A safe pool fence doesn't have to be overly expensive. If you need the pool safety fence for code, you better make sure that it will be approved by the Local Building Codes in Los Angeles. Many companies claim that their fence is approved. Don't be afraid to ask for a proof. Ask for the Research Reference Number! A cost-efficient way to ensure safety from any family member or friend would most likely be in the purchase of a mesh fence. Guardian Pool Fence is manifacturing mesh pool fences in Los Angeles. This type of fence allows the pool itself to be seen clearly, custom made with the color that best matches the pool's environment, while still being climb-proof and lockable. The right pool fence might want to consider can be used year round and stay protective through every season. A pool can pay off hugely as a source of entertainment, but a professionally installed pool fence should never go forgotten as an opportunity to enhance your comfort in knowing it's not dangerous either. There's no reason your pool shouldn't be a haven for activity, but there should be no shortsightedness when it comes to keeping you, your friends and family free from worry. With the right pool fence cost should never be an issue. A good, professional pool fence won't cost you any less than what you should pay for effective protection. A good pool without good safety measures is not worth having. If you have any questions or comments regarding Guardian Pool Fence Systems, please contact us. © Copyright Guardianpoolfence.com. All Rights Reserved.